Why would being right-handed make a difference? Because it works through dexterity, and always fails on sinister people. Of course. Barry, don't forget gauche people (French for left). 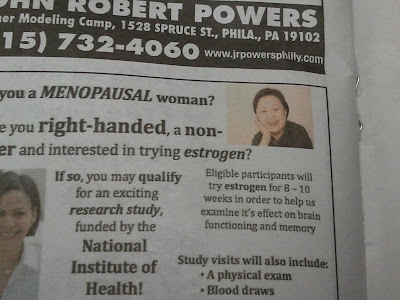 Anyway, I would also like to add that they say this is sponsored by the National Institute of Health indicating that either the writer/editor of this ad is a moron (which we already know), or that they are trying to deceive us. The government run health service is the National Institutes of Health (there are multiple institutes making up the whole). The NIH is the organization which is paying my son's way through medical school, so I am quite familiar with(and feel great affection for)them. On the other hand, I went to Johns Hopkins Medical School, so I am inordinately "s" conscious. It may require right-handed people because (as we all know) left-handers are the only folks in their right minds!